Commonly known as the London Plane, this tree is a hybrid between the American sycamore [Platanus occidentalis ] and the oriental species from south east Europe [Platanus orientalis]. Both of these parents were introduced into Europe in the early 1600s, but where and when the hybridisation and subsequent propagation occurred is unknown. The London Plane has the hybrid vigour that gives it the ability to survive and grow well, in such diverse places as polluted cities, and in a range of soils in many countries and climates. In many of these places its American parent will struggle to grow at all. It also has extraordinary resilience to recover from annual frenzied outbursts by tree surgeons, intent on keeping the tree in shape by pollarding, to appease the controlling tendencies of city bureaucrats. 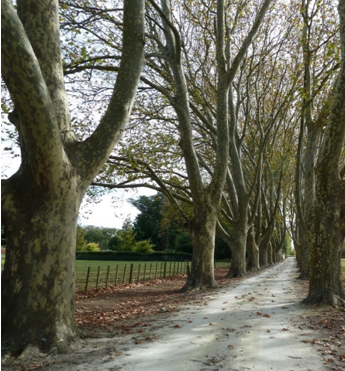 If given the freedom to grow, they can produce magnificent avenues or large shade trees suitable for many rural situations where summer shade for man or beast is welcome. Above left to right, foliage and seeds, bark, and a young Plane encouraged to reach its potential in a gully at Hautope. The regular flaking of patches of bark to produce a mosaic of cream, greys and buff browns is one this trees added features on a winter’s day. An outstanding feature is that this species can be easily grown from hardwood cuttings about two to three cms thick taken in early winter. One chink in the armour of this tree is that, in areas with higher rainfall in spring, the leaves can be attacked by a fungal disease called anthracnose, but with warmer dry conditions, and the tree recovers with new growth. This fungus also affects the Oriental Plane which can also be found in the Hawke’s Bay region. Some selected clones of this species have a more attractive orange colour in autumn. Neither the American Sycamore [P. occidentalis], or the Californian [P.racemosa] are recommended as alternative plane species. N.B. It has been claimed that like the Poplar species, Plane foliage has high levels of the trace element zinc, and that consumption by livestock may aid in the treatment of facial eczema. The Plane is a hardwood, and the timber needs to be handled accordingly. It is dense and heavy, pinkish in colour when first sawn, fading to a light brown. It is a very ‘busy’ timber to look at, with large rays when flat sawn (much like Oak), and heavily flecked on the quarter (giving a similar appearance to Rewarewa). 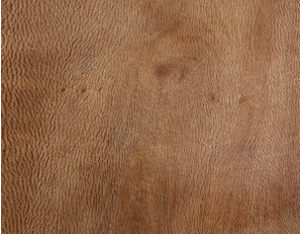 The timber is popular with woodturners, as it turns easily, and has also been used for inlays. I have not seen furniture made from it, as I suspect a large area of the timber would be best described as interesting, rather than easy on the eye! Thanks to Mike Halliday for the photographs on this page.